In 2017 the Selangor state government funded the Skim Peduli Sihat (SPS) initiative to provide healthcare coverage to the bottom 40% of household income class (B40). Under this scheme, the B40s were initially entitled to RM200/year (individual) and RM500/year (household) for primary care services. A qualiﬁed B40 individual would be provided a Kad PEDULI SIHAT for oneself or for the family, including a subsidy capped at RM50 per visit at selected private clinics within the state. Given the state government’s limited jurisdiction on healthcare and budget constraint, – structural changes to the Ministry of Health’s (MOH) facilities and workforce, as well as the increase in ﬁnancial allocation for Malaysia’s public healthcare system are beyond its jurisdiction – it was only able to subsidise medical payments to the B40s at the primary care level via the assistance of the private sector. Until October 31, 2017, the SPS card recipients totaled 149,382, and beneﬁtted almost 600,000 Selangorians. The former Selangor Chief Minister also announced its coverage expansion, as of 2018, to cover a one-off pneumococcal vaccination, which effectively increased the entitlement rate to RM700/year for B40 households. Encouraged by its success, Pakatan Harapan (PH) moved to incorporate an alternative SPS model into its 100-Days Manifesto. While SPS has alleviated the cost burden of B40s utilising primary care services at private clinics, it however lacks the universality that Malaysia’s public health system entails. Firstly, SPS is limited to primary care services which are broadly deﬁned as the ﬁrst-contact point with doctors for patients with undiagnosed symptoms or health concerns; and only includes the diagnosis and treatment of common illnesses at clinics (secondary and tertiary care services are mostly conducted in hospitals). This begs the question of why the federal government is opting to introduce yet another primary care scheme since the MOH and public healthcare system are already providing the aforementioned services at an affordable rate (i.e. RM1 consultation fee at MOH health clinics). Secondly, SPS is often criticised for failing to properly shield the B40s from rising healthcare costs, especially with its non-coverage of the more ﬁnancially demanding tertiary care. In the event of unforeseen serious illnesses, B40s would not be able to make use of SPS and must seek treatment from public healthcare facilities instead. For this reason, the initiative may not be the most efﬁcient method of pooling ﬁnancial resources to make healthcare more affordable and accessible to the needy. It is probable that the inherent weaknesses of the original SPS model led PH’s Health Ministry to seek an alternative social insurance scheme for the B40s whereby coverage would be expanded. The insurance scheme will be announced this November, and will offer an insurance protection of between RM10,000 and RM20,000 annually per family for hospital bills at both public and private healthcare centres. The targeted implementation date is set to be at the beginning of 2019. According to the Health Ministry, the cost of the proposed Skim Perlindungan Sihat B40 (SPSB40) will be fully subsidised by the government, and is believed to be the ﬁrst step towards social health insurance for all Malaysians. Deputy Health Minister Dr Lee Boon Chye stated that the implementation of SPSB40 will increase the percentage of Malaysians under health insurance to at least 65%. Currently, less than 30% of Malaysians are under some form of health insurance protection. Is the Alternative SPS Model Economical for the Government? Medical bills for tertiary care at private hospitals are costlier than in private clinics. To that end, it is therefore crucial for the government to study the ﬁnancial feasibility of implementing the alternative SPS programme. To study its viability, a basic risk assessment, as practised by private healthcare insurers, is required. This consists of analysing the probability and expected number of claims, as well as the expected average expenditure. The sum of the aggregate claim would be the risk against the pool of ﬁnancial resources the government holds, and would subsequently determine the maximum annual claim limit for each B40 household under the programme. Since MOH is not expected to earn proﬁts, the claim risk would be the only factor under consideration – this is based on the assumption that the SPS operation and administrative works will be handled by the existing MOH workforce and resources. The National Health and Morbidity Survey 2015 (NHMS2015) provides the proxy indicators for healthcare demand or utilisation, as well as further breakdown of the patterns displayed by different household income quintiles of the same year. This enables a more accurate estimation of the prevalence and utilisation patterns for the B40 population: The prevalence of out- and in-patient utilisations are 9.5% and 7.8% respectively (Table 1). Since an average household size in Malaysia is 4.1 per family, this would translate to 33.6% and 28.3% of B40 households needing annual access to out-and in-patient services. When accessing healthcare services, Malaysians generally have a choice between public and private facilities. The annual mean visits (or average frequency of visits per year) which was surveyed in the NHMS2015 shows that B40 individuals are three times more likely to utilise out-patient services at public healthcare facilities. Only 10% of the B40 patients chose private facilities for in-patient services (Table 1). This is in direct contrast to the T20 (top 20% of household income tier) population – of which access to healthcare is much easier – where 62% and 40% would consult private healthcare providers for out-and in-patient services. The NHMS2015 also reported on the mean perceived payment by the B40 population for the four major descriptive categories of treatment at private healthcare facilities, namely: minor health problem (RM41.45); major health problem (RM144.49); minor surgery (RM81.30); and major surgery (RM10,424.41) (Appendix I). The cost of major surgery in the private sector indicated a hefty ﬁnancial burden on B40 households as treatment charges averaged about 5.7 times higher than in the MOH facilities. * A high limit is possibly indicated in the T20-adjustment if the B40 applies the T20 tendency of choosing private over government healthcare facilities in the future – supposing they have the SPS scheme. Source: National Health and Morbidity Survey (NHMS) 2015, Ministry of Health and author’s calculations. Ideally, the federal government could pool allocations from the original SPS model, and convert it into a Takaful health insurance model for B40 households to pay for their tertiary care in the private sector. The estimated budget over the years as shown in Figure 1 indicates the increase trend following the rising number of B40 households in Malaysia. In order to initiate the new programme by 2020, the federal government has to set aside RM1.483bil for the maximum SPS claim budget. Source: Department of Statistics Malaysia and author’s calculations. In reality, however, a lower budget may be allocated as long as the government is conﬁdent in regulating the claims. In Selangor, the state government did not anticipate a 100% maximum claim from all B40 households (probably not all are qualiﬁed). Its initial target was only 250,000 families, which is about 36% of all B40 households in the state. For comparison purposes, the maximum possible SPS budget will be contrasted with the calculated expenditure wherever appropriate. Supposing that the estimates of annual mean visits and mean perceived payment for the B40 population utilising private healthcare services are made known, the scenarios for whether the government can afford to pay for B40 in-patient only, or both in- and out-patient medical bills are shown in Figure 2. Even if conservatively calculated and assuming they are only at baseline expenditure, the total B40 claims for both in- and out-patient bills would reach 98.7% of the maximum SPS budget by 2020. Beyond 2020, the government would run into deﬁcit unless additional funds are allocated. 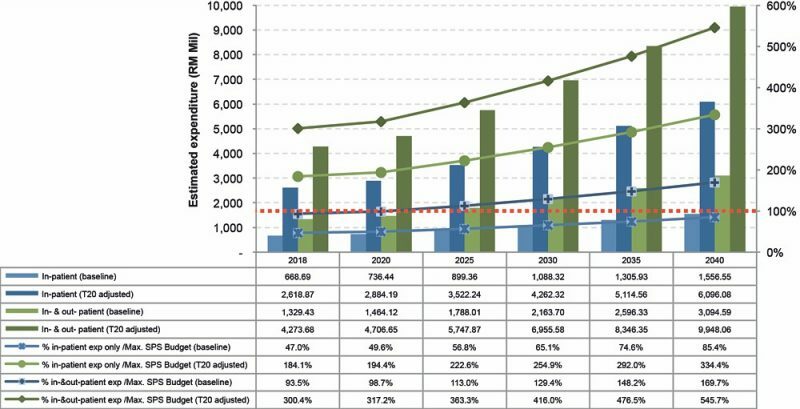 However, if the government is paying only for the B40 households’ in-patient bills, the allocated SPS budget would most likely be sufﬁcient until 2040 (the last point of cost projection). The government should be mindful that under the SPS Takaful programme, the newly-provided access to wider choices in the private healthcare sector would likely change the behaviour of B40 individuals, and may also result in the deviation of estimated expenditure from baseline expenditure. But what if the B40 individuals, like the T20, are inclined to private healthcare services? Correspondingly, the T20-adjusted expenditure of B40 individuals for both out- and in-patient services will be more than tripled and will ﬁnancially overburden the government, even if payment is only limited to in-patient bills (Figure 2). 2040, the percentage share is anticipated to drop further to 1.3%. The amount of pay out could seem substantial and unacceptable to defenders of the public healthcare sector. However, the policy’s bystander effect may also relieve the stress and overcrowding currently faced by urban public hospitals. The practice of public-private resource sharing should therefore be encouraged as part of MOH’s strategies to deliver quality health outcomes while keeping the healthcare cost in check. Health Minister Dr Dzulkefly Ahmad detailed the new SPS Takaful model to include health screening, preventive care and health promotion to all B40 households. In fact, when the health screening cost is considered and factored in addition to the in-patient tertiary care insurance, the combined cost rising from 62.0% in 2020 until slightly over the budget at 102.8% in 2040 indicates that the government is still very much able to afford the programme (Appendix II). Source: National Health and Morbidity Survey (NHMS) 2015, Ministry of Health and Federal budget estimates, Ministry of Finance, and author’s calculations. To ensure that the allocated budget is not exceeded, measures have been put in place by the government to control the SPS claims of the B40 households, including a maximum claim limit per household. Figure 4 shows the budget scenarios where the maximum claim per household varies from RM5,000 to RM20,000, with the private in-patient utilisation rate kept between the baseline of 10% and 38%. This indicates that if the B40 individuals do not change their health-seeking behaviour (e.g. remain at the baseline of “10% utilisation rate”), the maximum annual claim limit of RM10,000 per household will likely only cost the government 56.6% of the maximum SPS budget. Even a RM20,000 maximum annual claim limit per household would be feasible if this occurs at the rate of 88% and below. However, if twice the number of B40 households (e.g. “20% utilisation rate”) opt for private in-patient care and make maximum claims from the SPS Takaful programme, the RM10,000 annual claim limit may not be sufﬁcient for the government to stay within budget. 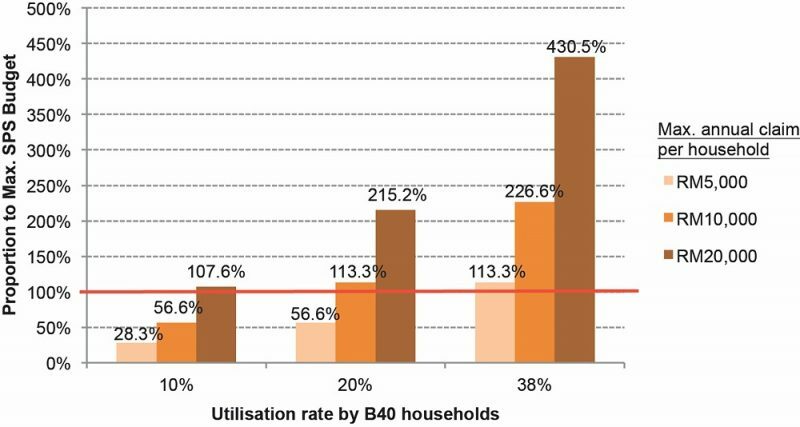 Note: Calculations assume 100% maximum claim rate for the B40 households that utilise the service. In view of more choices afforded to the B40 households, further measures must be introduced by the government to control the claim hike. One such measure is to entrust MOH doctors with “gatekeeper” roles at the primary care level, e.g. health clinics. SPS Takaful policyholders would need to obtain a referral from the health clinic doctor before they are able to utilise the SPS claim in any private healthcare facilities. This way, the government would be able to prevent unnecessary claims. Furthermore, patients could also be diverted to less crowded public hospitals instead or better-value private hospitals, thus driving down the claim pressure whenever appropriate. Lastly, the government should impose similar existing MOH rates of co-payment to the SPS Takaful policyholders for hospital charges to ensure there will be no preferential treatment given to the beneﬁciaries in choosing private healthcare services. Lim, Chee Han, 2018. “The cost-beneﬁt analysis of implementing compulsory health screening programme in Malaysia”, MSC 11 Proceedings: Selected Full Papers, Malaysian Social Science Association. *Original NHMS2015 data, the following years increase at 2.75% per annum. Source: Lim (2018) and author’s calculations. The government has been providing healthcare services at heavily subsidised nominal rates for the public sector, while the private sector has required patients to either pay out-of-pocket or claim from private health insurance. Although some tertiary care bills for B40 households will be contributed and guaranteed by the government, Health Minister Dr Dzulkefly Ahmad has stated that to develop the programme and extend its coverage to M40 and T20 groups, the policyholders are also expected to contribute to the common pool. To qualify as a Takaful health insurance model, this co-operative scheme is not-for-profit (excluding riba), and not for taking excessive (speculative) risk (excluding gharar). The NHMS 2015 did not specify or define what constitutes in-patient and out-patient services. In this case, we define “in-patient services” as 50% Major Health Problem and 50% Major Surgery; and “out-patient services” as 70% Minor Health Problem, 20% Minor Surgery, and 10% Major Health Problem. These definitions enable us to link up with subsequent costing calculations. 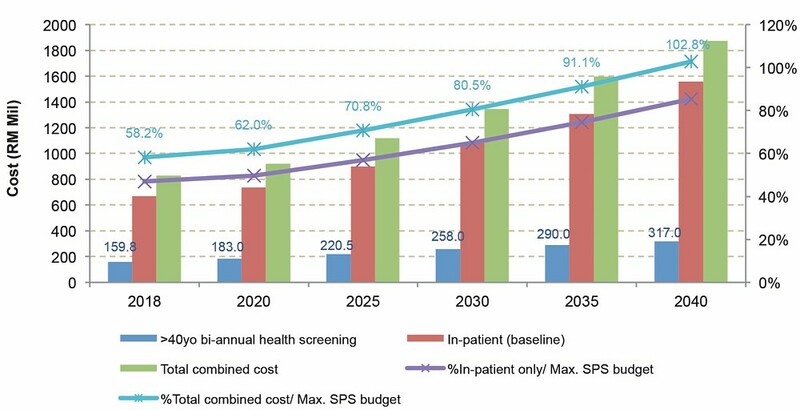 The health screening cost is calculated based on Lim (2018). The health screening programme is a proposed bi-annual compulsory programme catering for residents aged 40 years old and above, based on the South Korean and Singaporean models. This is especially crucial if the SPS Takaful programme includes payment for private out-patient services. Previous PostPrevious Can Batu Kawan Industrial Park be the Silicon Valley of the East?